The Learn and Earn Module’s online training tools to engage, survey and educate. Increase product knowledge and capture feedback with The Learn and Earn Module. More info on educating your workforce or customer base with Learn and Earn? Online training, survey and trivia features help you engage customers or increase your sales team’s product knowledge. A knowledgeable salesperson is a high-performing salesperson, and an engaged customer is a more loyal customer. But it’s not always easy to continuously engage and train those important to your business. 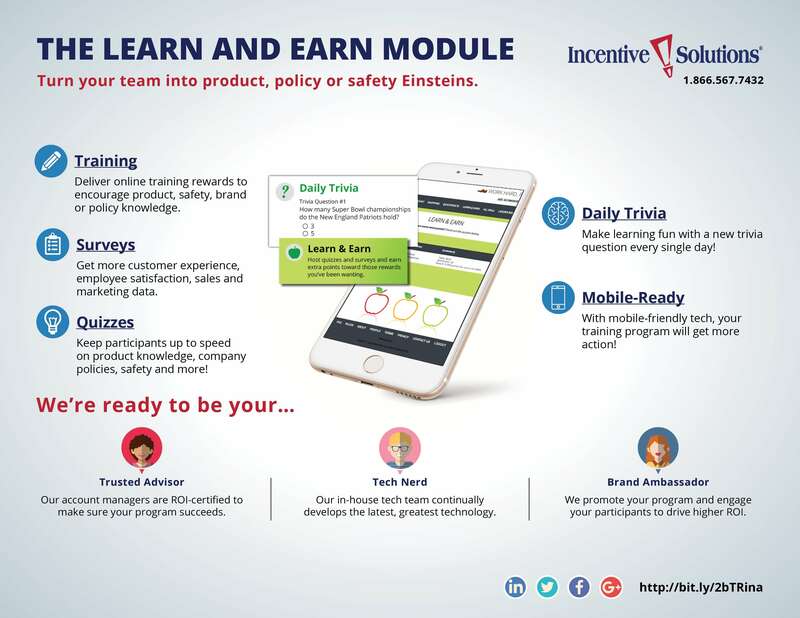 The Learn and Earn Module is designed to motivate your incentive program participants with points for completing online training and taking quizzes, participating in trivia to increase product knowledge, or filling out surveys and submitting customer feedback. Configure the content, frequency and reward pay-out so you can completely control which knowledge and feedback submissions are encouraged, and when. What are The Learn and Earn Module’s features and benefits? Online training quizzes help you increase product knowledge. Encourage reward program participants to fill out and submit surveys and customer feedback. Fun daily trivia questions keep your participants engaged in your program. Promote skill set expansion and adherence to policies and protocol. Deliver custom training content that includes embedded media, links, images and more! Distribute any reward amount you want for any Learn and Earn activities. Which pain points does The Learn and Earn Module help you solve? Employees, distributors and contractors uninformed about your products or services. Not enough product or service satisfaction feedback from customers. No way of knowing what kind of training you should deliver and who needs it. Customers not up-to-date on product updates or upgrade options. Customers not informed about supplemental or higher quality buying options. Salespeople aren’t learning and improving continuously. Which types of incentive programs should use The Learn and Earn Module? One of the toughest things about indirect channel sales is the limited communication you have with resellers, contractors or end-user customers. Using The Learn and Earn Module in your channel incentive program is a great way to motivate your B2B customers to complete easily accessible online training quizzes and fill out surveys. This gives you greater insight to their knowledge level and brand familiarity so you can improve the customer experience. The most successful salespeople are those who never stop growing, learning and training. Even the most experienced, top performers on your sales force can improve with continuous training. Whether you’re providing quick crash-courses or full, in-depth online training, Learn and Earn can help you keep your sales team educated, engaged and effective. Often, a lack of customer loyalty comes from a lack of knowledge. Your customers may buy from you infrequently, or buy only a select range of products and services, because they don’t know about other purchasing options could better serve their needs. Use The Learn and Earn Module to reward them for submitting feedback or customer satisfaction surveys so you can better understand and improve their customer experience. Training and motivating employees is a constant for every staffed business. With an employee motivation program that utilizes The Learn and Earn Module, you can invest in employee training so you can build a more skilled and effective workforce, rather than wasting resources hiring new employees and staring the onboarding process all over again. Which modules pair well with The Learn and Earn Module? Pairing The Learn and Earn Module with The Mobile App Module enables immediate, on-the-go access to features like quizzes, surveys and daily trivia. Convenient access encourages greater incentive program participation, which pushes your program closer to reaching your goals. Learn more! The Total Recognition Suite is a peer-to-peer and manager-to-peer employee recognition platform that helps you create an uplifting, motivating company culture. Paired with The Learn and Earn Module, participants can recognize and reward each other for their online training accomplishments. Learn more! Pairing up The Integration Services Module and The Learn and Earn Module allows you to integrate Learn and Earn features and reward points with your existing learning management system (LMS). Any rewards participants earn in Learn and Earn will transfer to your existing LMS and vise versa! Learn More! You can add extra momentum to participants’ online training and survey submission efforts by pairing Learn and Earn with The Leaderboard Module. Show participants a display ranking the lead learner and they’ll race to claim the top spot! Learn more!